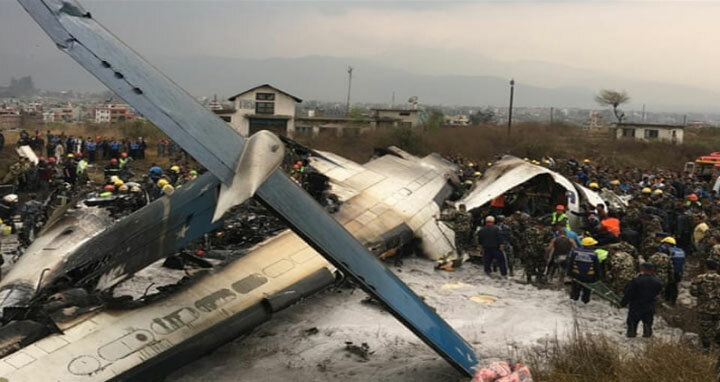 Dhaka, 12 Mar, Abnews: Around 50 passengers are feared dead as US-Bangla Biman aircraft crash landed in Tribhuvan International airport in Kathmandu on Monday. Airport security sources said about half a dozen passengers who were rescued in ‘critical condition’ have been sent to the hospital , while there were many ‘bodies’ lying in charred condition. There were 67 passengers in the plane, of them 47 were Bangladeshi nationals, 19 Nepalese and 1 Chinese. The TIA authority has suspected that technical glitches in the aircraft during landing at the airport. Earlier today, an aircraft of US-Bangla Airlines from Dhaka to Kathmandu crashed at Tribhuvan International Airport in the capital of the Himalayan country. Md Kamrul Islam, General Manager (GM), Marketing Support and PR of US-Bangla Airlines, confirmed about the accident. Seventeen passengers have been pulled out so far and rushed to the hospital, according to airport officials. According to TIA spokesperson Prem Nath Thakur, the aircraft caught fire after it careened off the runway during landing and crashed onto a football ground near TIA. The aircraft with call sign S2-AGU took off from Dhaka and landed at TIA at 2:20 pm. The plane can reportedly carry 78 passengers and firefighters were at the scene trying to extinguish a fire, BBC reported quoting local news site My Republica.